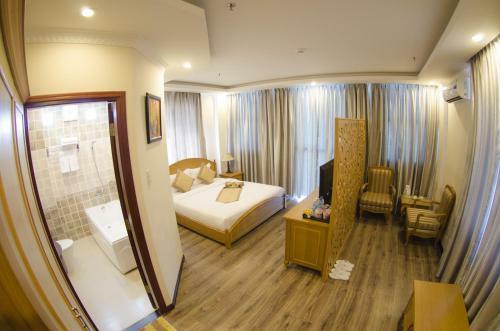 Madella Hotel is located in Can Tho, only 300 metres away from Ninh Kieu Pier. Rooms are modern and fitted with carpeted flooring. Guests also enjoy free WiFi access throughout the hotel. This well-appointed accommodation is only 100 metres away from Can Tho Museum. Cai Rang Floating Museum is 6.2 km from the hotel. Cooled with air conditioning, each room will provide you with a TV with cable channels, a seating area and a mini-fridge. Coffee/tea making facilities are included in all the rooms. There is also an en suite bathroom in all the rooms. Madella Hotel houses a 24-hour front desk with luggage storage space. Free parking facilities are available for guests who drive and laundry/ironing facilities offered at a surcharge.